paradigms will support effective test preparation. Utilize these insights to choose the best MTEL practice test and study guides. This preparation material will help you get from point “A” (where you are right now) to “C” (test prep process) to “C” (as passing MTEL score). Having a 360 degree perspective on the paradigm of the developers of this Massachusetts teacher certification exam will aid you in selecting the correct answers and passing the actual MTEL test. The Massachusetts Tests for Educator Licensure (MTEL test) was developed in 1988 as part of an initiative for individuals seeking a teaching license for Pre-Kindergarten to grade 12. In 2004 the MTEL programs incorporated vocational technical and adult basic training certifications also. The MTEL tests are designed to determine if educators seeking an entry level position have adequate knowledge in the subject matter and can communicate effectively with students and parents. 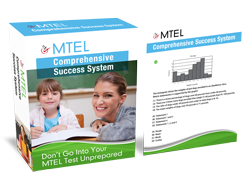 Go to: MTEL Practice Test Questions — for a FREE MTEL test prep report (by Michigan educators who passed). The contents of the MTEL exam has been developed in conjunction with Massachusetts educators, and other professionals involved in education. This assessment for Michigan teacher certification test content aligns with state licensing legislation, Massachusetts Vocational Technical Education Regulations, and the Basic Adult Education curriculum. The MTEL test program offers 4 test categories: Communication and Literacy, Academic (PreK-12) subject matter tests, Vocational Technical Literacy Skills Test, and Adult Basic Education Test. Tests are offered in either a computer or paper based format. Registration for computer based exams is only available on the internet, however for paper based exams registration can also be done by telephone or mail. There is a MTEL registration fee of $30 and a computer based testing surcharge of $25, for those who select the computer option. The exams themselves range in price from $30 for the Communication and Literacy Skills test (reading subset) to academic subject matter assessments which cost $100. Payment must be made at the time of registration. For on-line registration, applicants can use a VISA or MasterCard, or a debit or check card that has a VISA or MasterCard logo and doesn’t require a pin number. For mail registration, the fees must be paid by using a personal check, cashier’s check, or money order. Once the MTEL test registration has been processed, the applicant will receive a confirmation that indicates the test selection, test date, test time, and testing center. The MTEL testing center will ask a candidate to provide one piece of government issued identification that has a photograph and signature such as a drivers licence or passport. An applicant will also be asked to give a digital signature, palm scan or allow a digital photograph to be taken. Failure to comply with the test center verification process will result in not being allowed to take the test. It is important to arrive 30 minutes prior to the start of the MTEL exam. If you arrive 15 minutes after an exam has begun, you may not be admitted and no refund will be available. The MTEL assesses a candidate's reading comprehension, and writing skills in addition to the depth of knowledge in a specific subject. The exams contain multiple choice and open response items with the exception of non-English language exams that also test listening skills. Each exam contains sub-areas which have objectives that address key concepts of the subject matter. The test objectives of the MTEL are conceptual statements that are further clarified by descriptive statements. Multiple choice questions evaluate the candidates understanding of the objective whereas the open-responses assess comprehension on one or more objectives. The number of MTEL multiple choice questions is generally proportional to the number of objectives given within a sub-area. Passing the MTEL test is based on the number of correct answers. There are no deductions for wrong answers, so if there is uncertainty about an answer, it is better to guess than to leave it blank. The amount of time given for each exam is four hours. Candidates can take more than one subset in a four hour session or submit a separate registration for each subset which will allow a full four hours to complete one section. The MTEL test score report will be available on the internet on the published score report dates. The score will indicate the passing status of the applicant along with other performance information. Raw scores are converted to a scaled range of 100 to 300. In order to pass an applicant must receive a minimum of 240. The score is compared to an established standard. A firm understanding of the process and a lot of MTEL test preparation will help you achieve your goals and become a qualified, licensed teacher in the state of Massachusetts! "Why Not Pass The MTEL Now And Tell Your Own Success Story?" It actually covers the real MTEL! FREE MTEL practice questions (just like the exam). By MA licensed teachers who passed. Get FREE MTEL Study Guide Now!